with the Buttercup Cat Bed. Clever design is reversible and can be used flat or as an adjustable soft nesting cup when the drawstring is pulled. By opening or tightening the pull string you create the ultimate cozy bed just right for your cat. These beds are 24" diameter when flat. Cats naturally snuggle into cozy spaces. They seek out their own private nesting space. 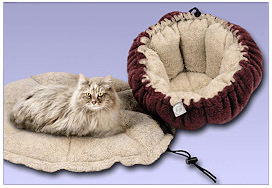 Imagine providing the perfect snug feeling that brings delight and comfort to your cat. Bowsers Buttercup Cat Bed is uniquely designed to offer what your cat desires. The size of the opening is adjustable by the mere pull of a drawstring. Attractive, practical, washable and durable makes the Bowsers Buttercup Cat Bed an ideal choice for your cat&apos;s comfort and well-being.